KARI has been laying solid foundations for the development of a Korean-made space launch vehicle ever since it began developing the Korea Sounding Rocket (KSR) in the early 1990s. After developing KSR-I, a single-stage scientific rocket, in 1993, KARI successfully launched KSR-II, a 2-stage scientific rocket capable of flying at three times the altitude of its predecessors, in 1998. On the strength of this achievement, KARI began to develop KSR-III, a liquid propelled scientific rocket, as the intermediate phase of a satellite launch vehicle development project in accordance with the Master Plan for the Promotion of Space Development, and successfully launched it in 2002. The development of scientific rockets has led to the securing of the basic technologies - including system integration, the design and fabrication of a liquid propelled engine, engine testing, and induction control and position control - required for the in-house development of launch vehicles, as well as laying the basis for the development of Naroho, Korea’s very first space launch vehicle, and that of a unique Korean model of launch vehicle. KSR-III (Korean Sounding Rocket-III), Korea's first liquid propellant rocket, was developed to attain the key technology for a small satellite launch vehicle. KARI succeeded in independently developing a 13-ton-class liquid propulsion engine in the five years between 1997 and 2003, which resulted in the acquisition of basic space launch vehicle technologies such as an inertial navigation system, a thrust vector control and positioning system, weight reduction technologies including a compound tank, Korean models of internal electronic systems, a propulsion supply system and ground support system-based technology, and liquid rocket launch operation technology. The KSR-II (Korean Sounding Rocket-II) is an intermediate-size scientific rocket developed over a period of five years between 1993 and 1998. With a payload of around 150 kg of scientific equipment, it conducted various research tasks, including measurement of the ion layer environment and ozone layer distribution at an altitude of 140km or more above the Korean Peninsula. Launched in 1997 and again in 1998, KSR-II reached a maximum altitude of 151.5km and observed space x-rays for the first time in Korea. Technically speaking, it featured paring, an initial position control system and an inertial navigation system, and provided the opportunity to attain the rocket 2nd stage separation technology. 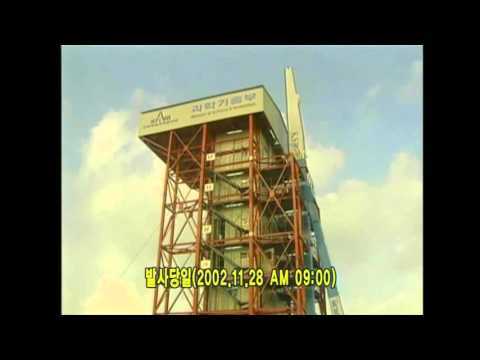 The scientific rocket KSR-I (Korean Sounding Rocket-I) became Korea's first scientific rocket, its development having begun in 1990. Using a solid fuel engine, KSR-I’s mission was to observe the atmospheric layer and the ozone layer at an altitude of 35km~75km above the Korean Peninsula, with a payload of less than 200kg. KSR-I was launched twice in 1993 to vertically measure ozone distribution in the stratosphere above the Korean Peninsula with a mounted UV radiometer.